Integrative medicine is a system of care that puts the patient at the center. The focus is on identifying the cause of illness rather than just symptom relief and the goal is to help people gain or regain and then maintain optimum health. Holistic care is a major tenet of integrative medicine, as is a personalized strategy. At Duben Holistic Chiropractic Center in Westlake Village, California, we offer a health and wellness center as well as family practice. Biological, behavioral, psycho-social and environmental influences all affect an individual’s health over the long term. These factors include diet, lifestyle habits, exercise, sleep patterns, emotional responses and thought patterns that interact with one another. For example, inadequate nutrition can result in nutrient deficiencies that affect the nervous system and the production of hormones. Genetics may predispose an individual to certain health conditions. Sleep deprivation increases the risk of obesity. Integrative medicine addresses all the potential causes of illness. It may include the use of acupuncture, massage therapy, aromatherapy, dietary supplements, targeted exercise, chiropractic care, and medication as well as many other strategies. Although the terms integrative medicine, complementary medicine, and alternative medicine may be used interchangeably, they are not the same thing. Conventional or allopathic medicine encompasses modern scientific systems of medicine, focused on the alleviation of symptoms through the use of medications or treatments such as surgery. Alternative medicine includes traditional practices such as the use of herbs, massage, acupuncture, or chiropractic care. Complementary medicine is a combination of both conventional and alternative medicine. Integrative medicine may include conventional medicine and allopathic approaches but also recognizes spirit and community as factors in overall health. The following are the common principles of integrative medicine. Patients and practitioners are partners in the healing process. Consideration is given to all factors that influence health, wellness, and disease. All healing sciences are used to promote and facilitate the body’s ability to heal; care is multi-disciplinary. Whenever possible, interventions are natural and less invasive. Integrative medicine is science-based and explores new paradigms. Treatment, health promotion, and illness prevention are paramount. Care is personalized and unique to the individual and fosters the development of healthy behaviors and skills for effective self-care. 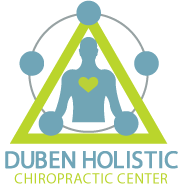 Call Duben Holistic Chiropractic Center Today! Whether you are dealing with musculoskeletal issues, fibromyalgia, chronic fatigue or simply want to improve your overall health, please contact Duben Holistic Chiropractic Center at 805-468-4437. Located at 3625 E. Thousand Oaks Blvd. Ste.172, in Westlake Village, we offer chiropractic care, nutritional assessment, laser therapy, applied kinesiology and spinal decompression to help relieve pain and promote health. As a health and wellness center, we are a family practice and our goal is holistic care for patients of all ages.